It was anything but the statesman-like performance expected of the chair of the Association of Southeast Asian Nations (ASEAN).He also warned journalists, including an international press corps of more than 100, to tell the truth. However, it was a state visit by Chinese PresidentHu Jintao just days before this summit began that initially raised eyebrows among observers. As a tribute, Phnom Penh was and still is festooned with Chinese flags and banners. 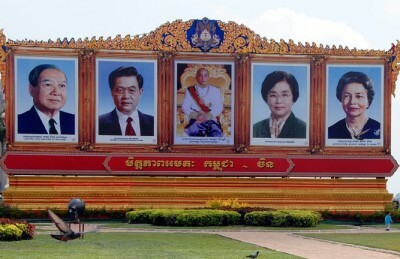 And, in a park outside the Royal Palace – on perhaps the most expensive piece of real estate in the county – giant pictures have been hung on a billboard that leaves little doubt about Cambodia’s close friendship with China. 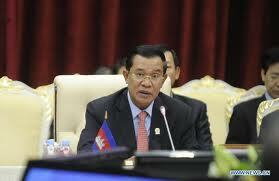 “Cambodia cannot be bought,” Hun Sen insisted. During his official visit, Hu told his Cambodian counterparts that as ASEAN hosts they should not be in a hurry to finalize the Document on the Code of Conduct (DOC). The DOC is supposed to be a structured means of dialogue engagement among ASEAN members to avoid any conflict or deal with any confrontation before it escalates into something much worse in the South China Sea. But it hasn’t been completed, and Beijing has made it known that it wants territorial disputes involving the Spratly’s dealt with on a bilateral basis and not at a regional level. Malaysia, Brunei and Taiwan also have varying claims.The Philippines managed to up the ante during the summit by urging a united front within ASEAN for handling China, and its President Benigno Aquino, told ASEAN members that the DOC must remain an internal, central ASEAN document. One observer quipped after the conference: “There’s no doubt now that China would also like to join ASEAN, but they’re not welcome by many of us.”Many here have suggested that with Cambodia as host, however, that may not matter. This entry was posted in ASEAN, Foreign Policy, International Affairs. Bookmark the permalink. Hun Sen is right about journalists, especially some of the foreign ones. That is why gatherings in Asia should keep most of the foreign media at arm’s length. In international affairs, the media is part of the problem. This atrocious performance deserves an “F” though the Phnom Penh summit would get a “B”. The South China Sea is an extremely sensitive issue. Though it is discussed at ASEAN it is essentially a matter for the claimant states. It is a matter of high politics. Therefore when commenting, non claimant states, the ASEAN Chair and Secretary General must tread this issue VERY VERY carefully and avoid giving ANY impression of partiality. For Cambodia, the next Summit will be MORE challenging as the external partners will be there and the pressure will mount. Still there is no excuse for such an uncivil outburst. Hun Sen is a nationalist and any suggestion that Cambodia is a proxy or an appendage of China by the media is unnecessarily provocative. He is shrewd enough to avoid handling the South China Sea issue. So I don’t expect much progress on the DOC (Document on the Code of Conduct) under Cambodia’s chairmanship of ASEAN. The problem is too complicated. But it can be expected to play host to discussions between ASEAN claimants (Brunei, Malaysia, Philippines and Vietnam) and China, if required. China- Cambodia’s relations is a long standing one. The Chinese also have a strong business presence in the country. The EU especially France except for providing some budget support through the Club of Paris is focusing on human rights and democracy and provides funding for NGOs and the political opposition. US business presence is minimal since Vietnam is their priority area. Remember, Vietnam was the only country to have defeated the PRC military during the Vietnam War. Cambodia is PRC’s satellite, whatever you guys want to make of it. Beggar’s can’t be choosers. The DOC will be lame while chairmanship (for whatever good that’ll do) remains in Phnom Penh. That’s why ASEAN is irrelevant, except for talk-kok sessions. If you can’t respect guests and media, however critical, then not only are you an unfit host, but a downright rude, arrogant hick. Satellite or not is irrelevant here, nor is a CRITICAL media. What IS the main point is a FAIR media and this most of the modern journalists are definitely not. Hardly surprising, as they mostly represent owners who control vast media monopolies and have their own agendas to push, and have no time for political, cultural or historical realities in other countries into which they more often than not, parachute down, send their “truth” reports and then parachute down into another part of the globe to continue their mission. The time is long overdue for this type of selective journalism to be thrown out. It is no surprise that there is now a rise in small but relatively independent media centres all over who try to give “the other side” of events. ASEAN only visible development every Summit the Welcome Board with the photos of the ten Heads of Governent gets better and better and more elaborate. Well at least there is some vertical movernment. What is Truth, Isa? Define it as you see it. Independence and nationalism? Wherefrom? There is no such thing as neutrality, as yours and my own opinions show. What we should be talking about is Hypocrisy – the bane of existence. PRC eschews a united ASEAN and insists on bilateralism when it comes to the S. China Seas – which enables them to intimidate, cajole and bribe individual members. The DOC requires much more work, but unless ASEAN can come up with a working model, this SNAFU will drag on indefinitely and the US becomes more entangled in the process. What is obvious is that Hun Sen is a terrible host, lacks a shred of diplomatic panache and has zero tolerance to perceptions which counter his molly-coddling to PRC. Even our very own Octo was never this ‘recalcitrant’. Was Mr. Hu’s state visit days before the Summit and an offer of U$D9 billion in investments, an accident of Nature or an act of Sacrificial Love? I think not.